I was making some butter this afternoon and realized that I'd never written a post about how I do it. I've had some requests to do just that, so this is as good time as any, right? Making butter always makes me smile because it brings to mind an I Love Lucy episode where Lucy, Ethel, Fred, and Ricky take a trip back to the "gay 90's". This meant that they couldn't use any inventions that came after 1900. I don't know about the historical accuracy of the episode, but the results, as usual, are hilarious. The girls bet the guys that they could stick it out longer, and one of the things they have do to is make their own butter and bread. 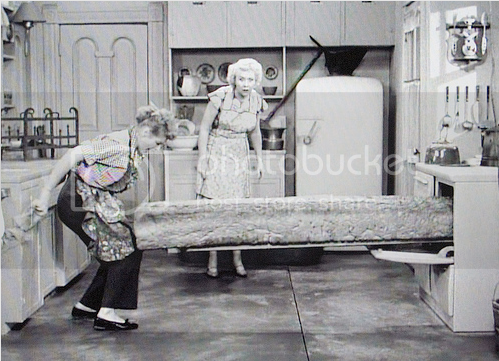 At one point, Ethel comes into Lucy's kitchen and asks how long you have to churn milk to get butter. LOL Well, that gets straightened out and Ethel comes in later with a good size amount of butter that she finally churned with Lucy's help. Her best line is, "All this butter and it only cost $23.10." Oh no! 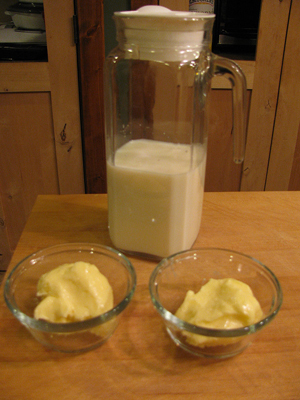 I'm glad I can make butter quickly and easily at home without churning by hand and without spending a lot of money. Our family buys raw milk from a local dairy that still has the cream in it. I let the milk set and after the cream has risen, I skim it off. You can definitely use store-bought cream though. I put the (very) cold cream in my food processor and turn it on. Then, I listen. Making butter is all about listening and learning what the different stages sound like. First, it's just sloshy, like you would expect. Then the cream starts to thicken as it gets whipped. It even sounds thicker. 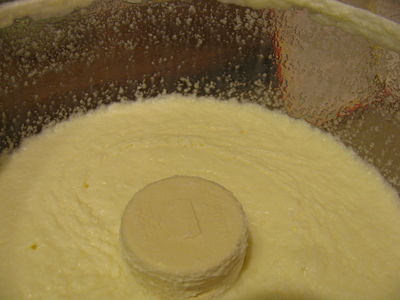 After several minutes, it starts to sound sloshy, and this is when I know the butter curds are separating from the cream. After the curds have separated, I pour them into a strainer to strain off the buttermilk. 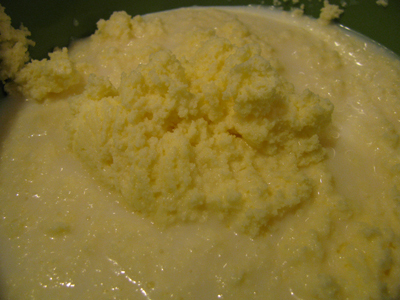 This is not thick, cultured buttermilk. This is a very mild milk with lots of whey. I've used it place of milk and buttermilk in baking with great results. Lastly, I wash the butter to remove the excess buttermilk. I do this by pressing the butter against the inside of a bowl while running water over it and letting the milky water run off. This water can be given to your pets to drink or just put down the drain. The more buttermilk that's left in your butter, the faster it will spoil. Now I salt it very slightly and refrigerate it. And that's it! Don't forget to make pancakes or waffles or biscuits with the buttermilk you strained off so you can try that yummy butter! Thanks for your post. I have tried and tried to make butter. I have been told so many things. One of the things is I can not use my food processor. Well now I know I can. Also how long do you let it set, over night? We run a Dairy farm and we have jerseys. I know you want it cold and Someone said put it in a glass bowl so you can see through it. Thanks again for the post and PICTURES. Love always reading your posts. Your way looks a bit easier! This is great! I only have one question. Where did you pull the yellow butter from that is in the smaller dishes. I think I missed a step or dont get it all the way. 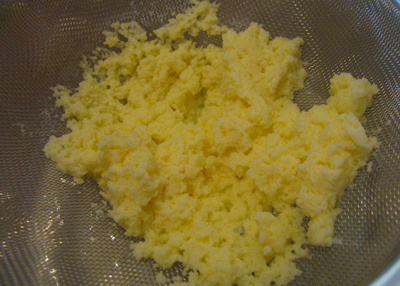 Is the butter left in the food processor after you take the curds off/and or strain the milk part out?